Wahawk athletes and coaches have played a prominent role in local, state, national and international sports. The Wahawk Hall of Fame in the new Athletic Addtion honors these great individuals from over the years. 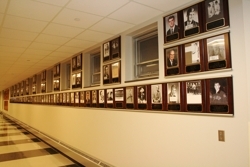 In this section, we will recognize our past sports legends, and share a bit of the Wahawk Hall of Fame at Waterloo West thru photos, stories, and information that we have gathered. Please let us know if you have and questions about past Wahawk athletes, and we will attempt to answer them.